Bertrand Russell’s intellect and his contribution towards his area of specialization are outstanding. Bertrand Russell had done major work as a British logician, mathematician, philosopher, historians, social activists, political activists and writer. He had made a great impact on society through his work. He is been also called as one of the founder members of analytic philosophy. He is also been considered as one of premier logician of 20th century. 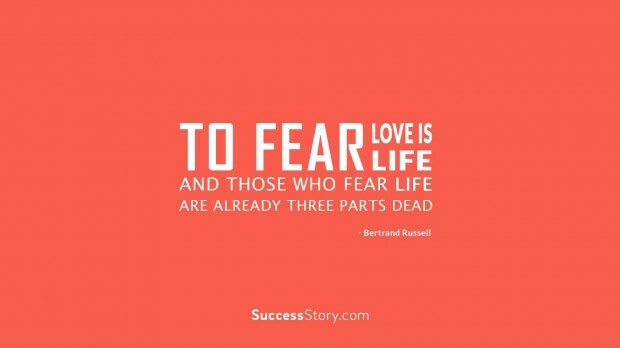 "To fear love is to fear life, and those who fear life are already three parts dead "
Bertrand Russell played an important role as an anti-war activist. For his writings which advocated idea of humanitarian ideals and freedom of thought, he was been awarded the Nobel Prize in Literature. In his quotes he suggested people not to fear love. Because he believed that fear of love is nothing but fear of life. He also thought in his quotes that those who fear life are very much dead. He held the position at the Advisory Council of the British Humanist Association and President of Cardiff Humanists till he was alive. Bertrand Russell was very actively involved in social and political work. He had worked for various causes till the end of his life. He enforced the idea of “single supreme world government” where he also believed that only cooperation can save mankind. In "Reflections on My Eightieth Birthday" Russell talked about his personal social vision in life. He stated in his personal vision that he cared for all beautiful and noble things. His social vision talked about society where every individual grows freely and evil things has no importance.